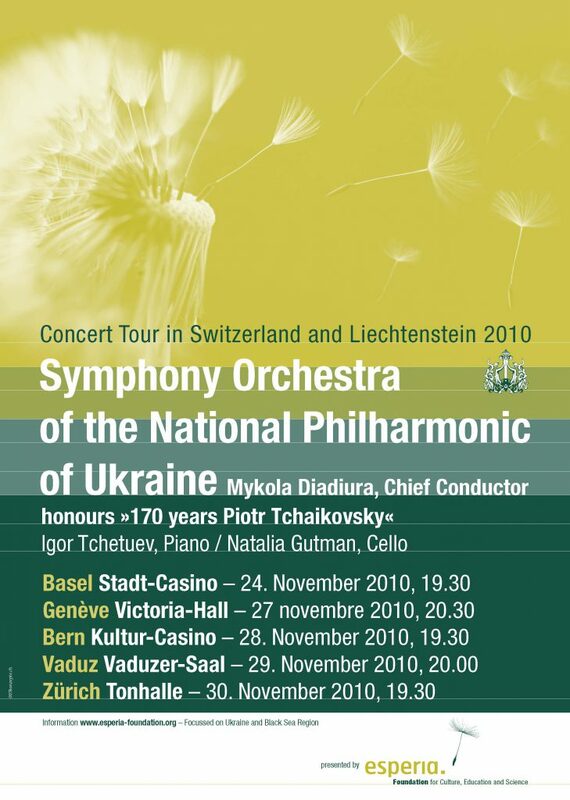 In honour of Tchaikovsky’s 170th anniversary this year the »Symphony Orchestra of the National Philharmonic of Ukraine« presents symphonies, piano concerts and ballet music of this remarkable composer. You will find in the special selection some of his most popular compositions. 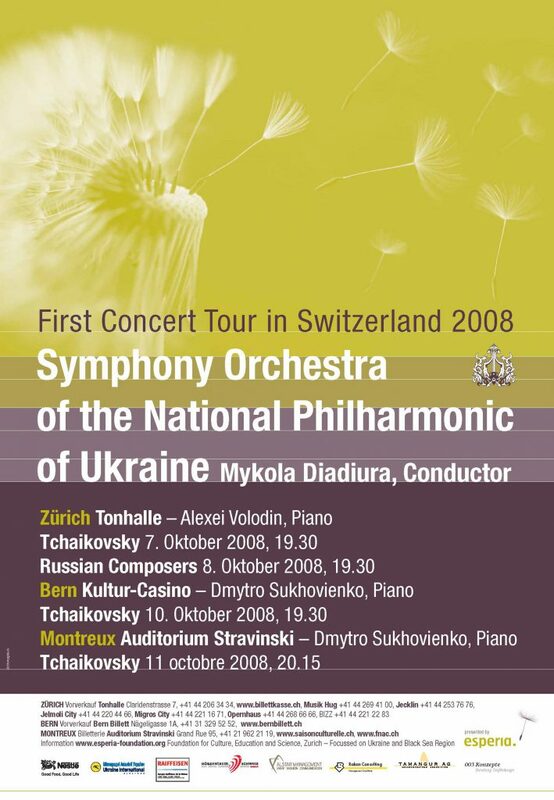 Enjoy these incomparable concerts with Maestro Mykola Diadiura, who studied among others under Professor Roman Kofman at the Kiev Tchaikovsky State Conservatory. Piotr Ilich Tchaikovsky (1840 – 1893) was a leading Russian composer of the late 19th century, whose works are notable for their melodic inspiration and their orchestration. Among the most subjective of composers, Tchaikovsky is inseparable from his music. His work is a manifestation of repressed feelings that became more and more despairing in later years and were most fully expressed in his Sixth Symphony, one of the greatest symphonic works of its time. His last three symphonies are deservedly famous, and to these should be added the First Piano Concerto and the Violin Concerto. Notable among his other orchestral works are the early Romeo and Juliet Overture and the exquisite Serenade for Strings. Of the operas, Eugene Onegin is a masterpiece and The Queen of Spades dramatically effective. His chamber music includes string quartets, solo piano music and many fine songs. Tchaikovsky’s Piano Concerto No. 1 (1874-1875) in B-flat Minor, is one of the most popular concertos in world music literature. Tchaikovsky showed the score to Rubinstein who suggested some corrections. The composer refused adamantly (after several years however (in 1879 and in 1888) he wrote two new versions). Acting upon advice of Karl Klindoworth (a pianist who taught at the Moscow Conservatory), Tchaikovsky gave the manuscript to Hans von Buelow – a German pianist and conductor, who happily agreed to perform the work. The concerto is dedicated to him. The first performance of the original version took place on October 25, 1875 in Boston, Massachusetts, conducted by Benjamin Johnson Lang. The concerto was a huge success. The Russian premiere was on November 13, 1975 in St. Petersburg with Gustav Kross and Eduard Napravnik. With Sergei Taneyev as a soloist and under the baton of Nikolai Rubinstein, who reconsidered his opinion to Tchaikovsky’s work, the last had its Moscow premiere. Subsequently Rubinstein repeatedly performed it as a soloist. The concerto became enormously popular. In the 20th century it was part of the repertoire of outstanding pianists like Anton Rubinstein, Vladimir Horowitz, Emil Gilels, Svetoslav Richter, Vladimir Eshkenazy and many others. Since 1958 it is part of the obligatory programme at the final tour of the international Tchaikovsky Competition in Moscow. 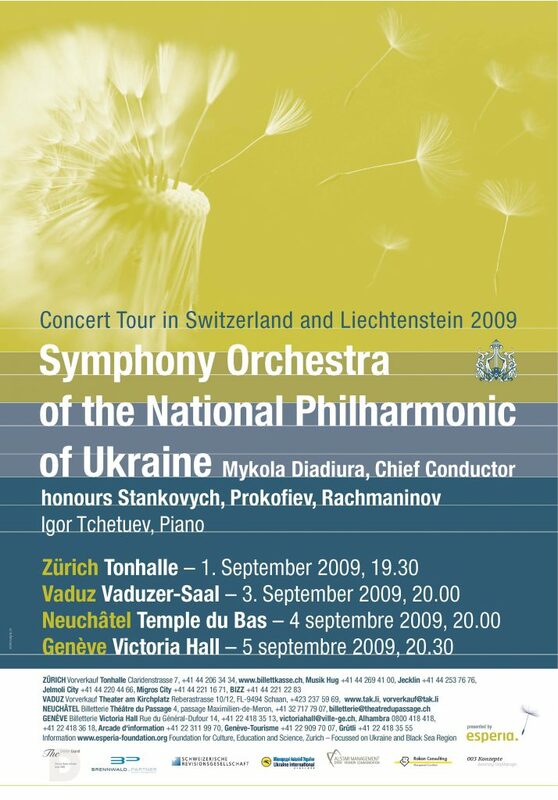 In the music of the concerto Tchaikovsky used themes from Ukrainian folk songs, as well as the French chansonette “Il faut s’amuser, danser at rire” in the second movement. The theme of the introductory section of the first movement is based on a melody that Tchaikovsky heard performed by blind beggar musicians at a market in Kamenka, near Kiev. Themes from the Ukrainian folk song “V’idy, v’idy, Ivanku” were used in the finale. The solo part is distinguished by extremely expressive virtuosity and the unity of the piano with the orchestra gives the work features of a symphony for piano and orchestra. In October, 1879 Tchaikovsky started composing a new piano concerto. The writing went quickly. By the following March, he had completed and orchestrated it. Piano Concerto No. 2 in G major was dedicated to Rubinstein who was never destined to play it, however, as he died in March 1881. The premiere performance took place in New York, on 12 November 1881. The soloist was Madeline Schiller, and Theodore Thomas conducted the New York Philharmonic orchestra. The first Russian performance was in Moscow in May 1882, conducted by Anton Rubinstein with Tchaikovsky’s pupil, Sergei Taneyev, at the piano. There is a notable link between the codas of First and the Second Piano Concerto. The Variations on a Rococo Theme (premiere in Moscow, 1877) for cello and orchestra, was the closest Pyotr Ilyich Tchaikovsky ever came to writing a full concerto for cello and orchestra. The music was inspired by Mozart proves Tchaikovsky’s admiration for the Classical style. However, the Thema is not Rococo, but actually an original theme in the Rococo style. The piece is composed of a theme and seven variations (eight in Tchaikovsky’s original version), making up roughly 20 minutes of music. The variations are played without pause, except between the last slow movement and the finale; even these are not set off by the thick double bar which traditionally indicates separate movements, but only by a fermata over the final rest. The difficulty of the piece lies in this seemingly innocent set-up of the eight differing sections, without the usual longer orchestral interludes for the soloist to catch his or her breath. Tchaikovsky is regarded as the master composer for classical ballet, as demonstrated by his scores for Swan Lake, The Nutcracker, and Sleeping Beauty. The Nutcracker is a two-act ballet. Tchaikovsky’s adaptation of the story “The Nutcracker and the Mouse King” by E. T. A. Hoffmann was commissioned by the director of the Imperial Theatres Ivan Vsevolozhsky in 1891. The original production was staged by Marius Petipa on 18 December 1892. In Western countries, The Nutcracker has become perhaps the most popular of all ballets. Tchaikovsky made a selection of eight of the numbers from the ballet before the work’s December 1892 premiere, forming The Nutcracker Suite, intended for concert performance. The suite was first performed, under the composer’s direction, on 19 March 1892 at an assembly of the St. Petersburg branch of the Musical Society. The suite became instantly popular, but the complete ballet did not begin to achieve its great popularity until after the George Balanchine staging became a hit in New York City. The The Sleeping Beauty holds a notable place in the history of ballet, not only as a great work in its own right but also as a defining moment in many lives. It is a ballet in a prologue and three acts. The premiere performance took place at the Mariinsky Theatre in St. Petersburg in 1890. The work is widely regarded as Tchaikovsky’s finest ballet score, and has become one of the classical repertoire’s most famous ballets. Its focus is on the two main conflicting forces of good (the Lilac Fairy) and evil (Carabosse); each has a leitmotif representing them, which run through the entire ballet, serving as an important thread to the underlying plot. Act III of the work, however, takes a complete break from the two motifs and instead places focus on the individual characters of the various court dances. In August 1893 Tchaikovsky completed his last Symphony No. 6 in B minor (Pathétique). On October 28 he conducted its first performance in St. Petersburg. The second performance, under Eduard Nápravník, took place 21 days later, at a memorial concert on November 18. It included some minor corrections that Tchaikovsky had made after the premiere, and was thus the first performance of the work in the form in which it is known today. The first performance in Moscow was on 4/16 December, under Vasily Safonov. The music of the symphony used broad, decorative, and striking themes, and the orchestration is rich – but without any attempt at spectacular effects.The last movement is slow and mournful – the composer finished the symphony as a farewell to life. Yevhen Stankovych is one of the central figures of contemporary Ukrainian music. A prolific composer, he has since 1966 authored six symphonies, an opera Â«When the Fern BloomsÂ», five ballets, a large number of works in the oratorical, vocal chamber and instrumental chamber genres, as well as incidental music to six music theatre plays and over hundred films. Yevhen Stankovych is one of the central figures of contemporary Ukrainian music. A prolific composer, he has since 1966 authored six symphonies, an opera «When the Fern Blooms», five ballets, a large number of works in the oratorical, vocal chamber and instrumental chamber genres, as well as incidental music to six music theatre plays and over hundred films. Born 19 September 1942 in the city of Svaliava Yevhen Stankovych studied music in the music institute of Uzhgorod. Stankovych began his university studies at Lviv Conservatory and following his first year transferred to the Kyiv Conservatory where he studied under Boris Lyatoshynsky and later under Myroslav Skoryk. Beginning with his first compositions, Stankovych declared himself as a composer of dramatic temperament, not adverse to emotional risk. The composer’s elaborate polyphonic textures and meditative lyricism are reminiscent of the strict instrumental style of Baroque music, while the full-bodied affects with the obvious post-romantic colouring give the music warmth and expressiveness. His music is remarkable in many respects, showing his emotional freedom, consummate technical mastery and flexibility of form. Yevhen Stankovych is the recipient of several major awards. His Chamber Symphony No. 3 was selected by UNESCO’s World Tribune as one of 10 best works of 1985. He has been recognised with several awards in Ukraine, including the country’s highest award for artistic creativity, the Taras Shevchenko State Award. The composer’s works have been performed in Canada, the U.S.A., Germany, France, Switzerland, Finland, Spain, China, the Philippines and Yugoslavia, in addition to performances in former U.S.S.R. and in countries of Eastern Europe. In January 1992, he was the senior juror at Canada’s First Contemporary Music Competition held in Winnipeg and has been featured at contemporary music festivals in Germany and Poland. In 1996, he was composer-in-residence in the Canton of Bern, Switzerland. Yevhen Stankovych is chair of the Faculty of Composition at the Kyiv Conservatory and former Chairman of the Composer’s Union of Ukraine.